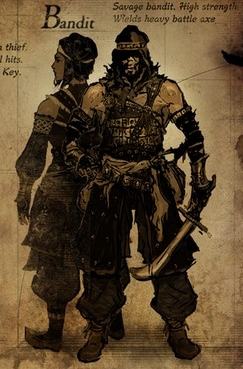 The Bandit specializes in hard-hitting physical attacks, and is great with weapons such as axes and straight swords. The starting battle axe is great for the game’s early areas, where dealing with enemies in as few hits as possible is important. Their high endurance and strength will mean that of all classes they deal the most damage at the beginning of the game. The Spider Shield blocks 100% of physical damage, and has excellent poison resistance. The Bandit’s magic stats are very poor, so using any kind of magic isn’t an option without spending a lot of levels on one of those stats. Their starting armor also isn’t great, but they have no trouble equipping better armor and shields as the game progresses.